Have you ever used a hair dryer and realized how much it burned your hair, taking away its smoothness and just drying it out? Well, then you should consider treating your hair with more patience and use a hooded hair dryer that gives your hair moisture and protects it from damage. Or maybe you’re not even using a hair dryer, but you hate going out with your hair still wet, which is not a very good option unless you’re living somewhere with a hot climate all the year around. Remember, washing and conditioning your hair are just two steps to achieving healthy, silky, beautiful hair. How you dry your hair also plays an important role, in your hair’s health, and how you feel about yourself! We know sometimes it’s a struggle to keep our hair healthy and attractive, so we’ve picked up for you some great hooded hair dryers that work great on all types of African American hair. But first, let’s get more familiar with what a hooded hair dryer can offer to you and your hair, and how they work. 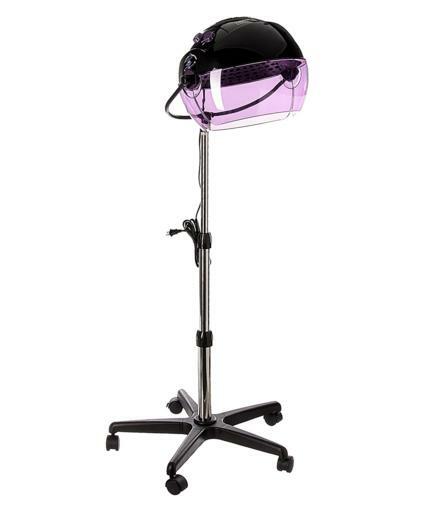 These devices that you place over your head are extremely practical tools for drying your hair. You can use them while you’re catching up with the new trends from your favorite magazine in a saloon or while you’re checking out what Cookie is up to in Empire, in the comfort of your own home. One of the main differences between a normal hair dryer and the hooded one is that when wearing the device on your head, warm air circulates all throughout the hair, unlike a typical hair dryer that pushes hot air with force. You can imagine that process does nothing beneficial to your hair, especially over the long term. As women of color, we know that over-processing our hair can make it fragile. We want to use the best tools to keep it full, healthy and strong as long as we can. The only main disadvantage of most hooded hair dryers is their lack of portability. Justas in any situation, you can use that disadvantage to your advantage by taking your time to think of ways to style your hair while it’s still wet. That’s one of the great things about these products! If you want those amazing curls or crave needle straight hair you should totally use one of the dryers below. Besides, these hair dryers not only dry your hair causing less damage, but they help you style your hair the way you want. Of course, the time it takes for the hair to dry depends on the length as well. Also, another great benefit is deep conditioning, which allows the hair conditioners you use to absorb easy into your hair, contributing to its effectiveness. Conditioning your hair under heat provides a really good hydration and it also makes it stronger. The hooded dryers will reduce fizz, make it shinier and will change your hairlike you’ve never seen or felt before! So, if we convinced you to consider this option for yourself, here are four more specific options of hooded hair dryersthat your hair will be thankful for. 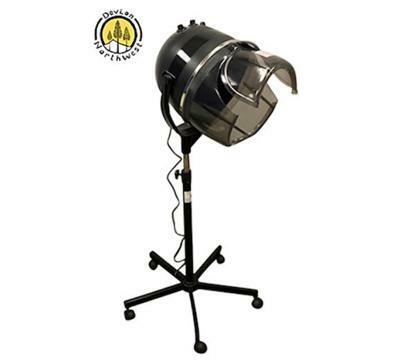 We’re going to start with the hooded hair dryer Pibbs 514 1100W from Dri Salon Dryer. This model not only has a classy look, but it’s also amazing for your hair. 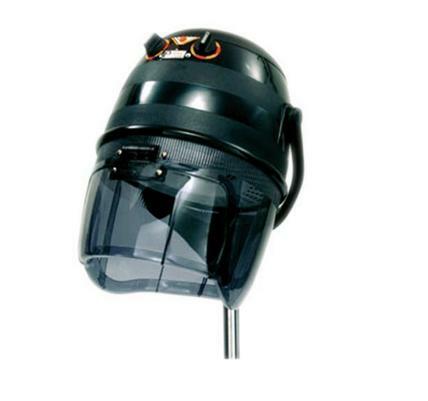 This dryer nourishes your hair while drying it, and it comes with an adjustable flip-flop head visor and an adjustable stand to alter the size of the device. It only takes a few minutes for the dryer to do its magic because of its varying range of temperature that goes from 0 to 70 degrees, and it has 1100-watt power that you could probably have guessed from its name. Of course, you can control the time and the temperature with the help of two dials. Make sure you use a hair net with this one and pin your hair properly, to avoid hair damage and get the best results. Then there is the Tourmaline Tools 1059 1875 Watt produced by Hot Tools Portable Salon Dryer that has an amazing Nano ionic technology that will give your hair a silky texture and healthy look. It can be easily moved around wherever you want to put it thanks to its nine feet long cord. And as if that’s not enough, you can also use hair rollers to style your hair the way you want to, because of its huge head visors! It also has a pre-moisture system and a power of around 1875 watts that will dry your hair in no time, without drying it out. And if it gets too noisy you can easily cover up the sound with your favorite TV series or just give your mother a call, she will surely be happy to hear from you. 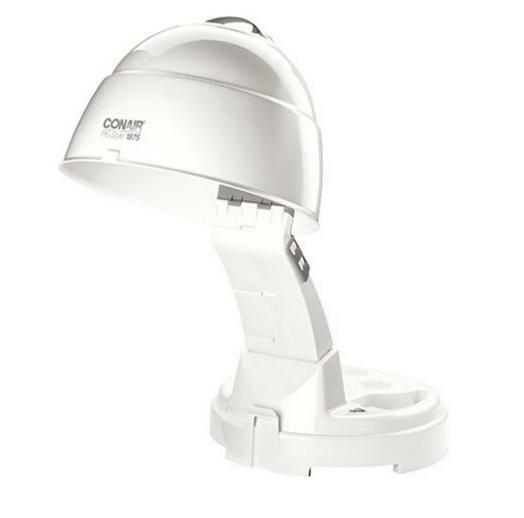 The next hooded air dryer is the Conai Pro Styler White Bonnet Hair Dryer. The dryer comes with a minimalist and sharp design, which could look great and bring a nice touch to the place where you will use it. One of it’s biggest advantages is that you can easily fold it and store it with the minimum space used. As for its technology, the Conai Pro Stylerhasairflow settings that are adjustable depending on your hairstyle. You can also easily set its speed and heat. Unfortunately, it has no cooling settings, with the temperature varying from warm to hot. Also, you cannot adjust the length of the dryer, but it does its job very well and leaves the hair nice and smooth. Last but not least, the Devlon Northwest 800-watt HoodedHair Dryer is a very friendly one, and it’s easy to move around thanks to the set of five movable wheels. It’s also very simple to use, you can just turn the switch on whenever you want to use it, then switch it off. The technology it has stays in a triple fan speed setting, which has an inbuilt power of 800 watts, allowing you to control the temperature and set the heat as high or low as you wish, with a limit of 80 degrees, which is great! If you can ignore its noise, you can think of new ways of styling your hair. Do you want to get that loose curly look? Because the dryer comes with a large hood you can easily put your rollers on before drying, giving you those shiny bouncy curls. Now that you have these options, do your hair a favor and give it the silky texture and beautiful healthy look you both surely deserve! No matter the option, the hooded hair dryer is totally a must for great looking hair that you can use whether at a salon or at home. You can easily create the volume that you want your hair to have, go for stretch curls and get that salon look that always makes you look like a whole team of professional hairstylist around.So,which one of the hair dryers will you pick?